Readers please refresh your memories for the immortal songs from the vintage Hindi film music and be ready for a rewarding nostalgic musical journey . A bird’s eye view- was earlier given on this mag, under “Music Review” about the captioned bumper album .. If you are a music lover (not necessarily an aficionado) and if you were born before 1945, you retrieve your memory and recall “Golden melody period” from 1950 till 70s, when the Hindi film music was the king of bollywood and dished out immortal , lilting melodies composed and based on our own cultural/musical heritage of Indian Classical, Folk or Bhav geets written by reputed lyricists in pure mix of Hindi and Urdu , which was then the colloquial language of India. Recall the compositions of stalwarts music directors like Saraswati Devi , Timir Baran , Khemchand Prakash, R C Boral, Pankaj Mullick , Bulo C Rani, Husnlal Bhagatram , Anil Biswas , Naushad, Ghulam Haider, etc. from amongst the seniors and then followed by younger talents who became more famous than the senior masters like, C Ramchandra, Sachin Deb Burman, Shankar Jaikishen, Madan Mohan , O P Nayyar, Roshan, Hemant Kumar , Chitragupt ,Vasant Desai , Sardar Malik, Kalyanji Anandji , R D Burman , Bappie Lahiri etc. etc. who created the classy golden era of our vintage film music. The music lovers will remain grateful to the then HMV ( Now new Avtaar is Saregama in India), who used to produce the records of such unforgettable /classy music , the then Radio Ceylon and the then Radio Goa , who used to broadcast such music which still continue to linger in our ears. Great announcer presenters , Vijay Kishore Dubey and Gopal Sharma used to innovate interesting ways of presenting such music in various forms. Later on, the creative radio programmer and announcer Par excellence Ameen Sayani , created and still creating a history . Fist by presenting the Geetmala programme on Radio Ceylon with his reverberating and crystal clear voice replete with pure Hindi and Urdu , and now bringing out another milestone musical nostalgia to us in association with Saregama in the form of CDs and Cassettes with added creative and live inputs of his own and legacy of the celebrity people behind it. It was Ameen Sayani, who had conceived and produced a half hour programme of 7 outstanding/popular songs of the week broadcast on Radio Ceylon for the makers of Binaca Toothpaste, titled “Binaca Geetmala” way back in 1952. At my small town, I used to remain glued to the neighbour’s radio for this music feast .The programme became phenomenally so popular that the sponsors had to double the duration of Geetmala to one hour each week from 1954.The format too improved in its design in concept in the form of HIT PARADE consisting of 16 top songs of the week . The list was authentically compiled from the music sales of those songs all over India, coupled with popularity of the song. In years , “Binaca” became “Cibaca” and so the Geetmla name also , but without changing the inimitable presenter Ameen. It created a history with 45 years of continuous radio broadcast . At the end of each year, it presented the most popular 16 songs of that year which were treasured by all connoisseurs . 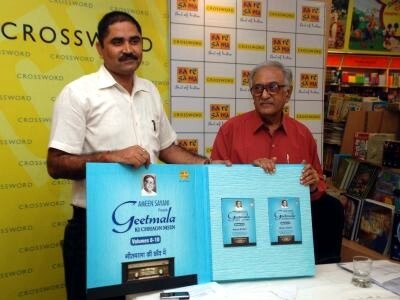 Saregama and Ameen Sayani , brought back this Hindi vintage music legacy from 1952 to 55 in first five volumes captioned as “Geetmala Ki Chhaon Mein” some time back . Inspired and encouraged by the brisk sell of those volumes ; both Saregama and Ameen now have compiled and released an improved set of next five volumes numbering 6-10 of the most popular songs of the years in 1956 to 58, culled out from the Geetmala archives with added juicy comments ,memorabilia and in-puts thrown in, which was hitherto not known to the public or music lovers to make it a truly collectors’ treasure. To do justice to such a “voluminous creativity” it will not be possible for me to analyze and review the same in one go. I would, therefore, do it volume wise in five instalments. Sorry, there is a suspense for few days to see the review of volume 6 ( first of this 6-10 series) as yours truly is going to Goa to cover the prestigious 40th International Film Festival of India.